Published: April 27, 2015 at 01:35 p.m. Updated: April 27, 2015 at 02:45 p.m.
As a sports talk host and a fan of sports beyond just football, I've always felt like it is beneficial to borrow from other sports in order to make salient points on football. In this year's draft, we can talk about boom/bust prospects and safe draft picks all we want, but the best analogy is likely provided by baseball. The team taking Dorial Green-Beckham has a looping, uppercut of a swing and is coming out of its shoes with each cut. That team will either hit a long home run or it will get fooled badly by an offspeed pitch and head back to the bench with a strikeout. On the other hand, Arizona State wideout Jaelen Strong is likely to be a single with a chance to get into the gap for an extra base hit. I don't see him as a home run, but a team is unlikely to whiff on him either. Boom-or-bust prospects live in every draft for every sport and general managers willing to take them will be lauded as a "genius" or sent packing depending on the results. 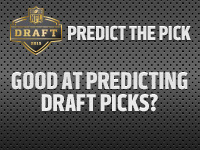 So who goes boom and who goes bust in the 2015 NFL Draft? The ultimate boom/bust prospect in this year's draft plays the ultimate boom/bust position. According to data from STATS LLC, Winston saw his explosive passing percentage go from 9 percent in 2013 to 6 percent in 2014, while watching his turnover-per-play ratio go from 1:54 in 2013 to 1:33 in 2014. Translation: Defensive coordinators were ready for Winston after studying his 2013 tape and made it much tougher for him to have the same level of success that he had in 2013. Winston's off-the-field concerns will be vetted by interested teams. Organizations ask themselves "what will (player X) do with more money and more time on his hands?" about every player they consider drafting, and they will have to be okay with the answer they come away with on Winston. Winston isn't going to hurt many teams outside of the pocket with his legs, but he's got the size that every NFL team covets and he's extremely sharp. He has shown the ability to play chess on the field rather than checkers, and Winston is clutch. Winston's yards-per-attempt jump from quarter to quarter -- 6.7, 8.5, 8.6 to 10.2 (fourth quarter) -- and he posted a 9.7 yards-per-attempt average when down by one to three points in the fourth quarter. His QB efficiency numbers improved with each quarter going from 117.1 in the first quarter to 164.0 in the fourth quarter. Remember those 18 interceptions in 2014? Only one interception came in the fourth quarter, and FSU was up by 11 at that point against North Carolina State. Clearly, Winston hasn't shown a consistent level of maturity up to this point and his productivity took a sharp dip in 2014 despite playing with seven offensive teammates who should be drafted this season. Winston has the intelligence, confidence and talent to boom, but there are bust signs that cannot be ignored. Buyer beware: Gregory has three failed drug tests on the record before taking his first NFL snap. On the field, Gregory was good but not elite last season as a pass rusher. His thin frame has some NFL personnel men concerned with how he will hold up as an edge setter against the run. What Gregory does have is tremendous length and "speed-to-power" potential as a pass rusher. Few in this draft have the closing burst to the QB or to a running back trying to get around the corner that Gregory has. Gregory is likely to fall in this draft due to his off-field concerns, but whoever ends up taking him will likely have either a Pro Bowler or a complete bust on their hands. I don't see much of an in-between. The fastest way to hit a boom-or-bust list is to shoot up draft boards suddenly after running a fast 40-yard dash time at the NFL Scouting Combine or a pro day. To be fair, I had Perriman mocked in the first round to the Patriots even before his 4.27 40 time at his pro day, but that is because the tape showed blazing speed and unusual short-area quickness for a player his size. Perriman has the traits at wide receiver that every team covets and he will go in the first round of this year's draft, but his route running and hands are issues right now. Perriman caught just 50 of 99 targets, and some of those incompletions were because of his routes. Perriman had eight drops and a drop percentage of 13.8 percent, which is far and away the worst of any of the top receivers in this year's draft. "DGB" has size, play speed and ball skills that are hard to teach. He has the long strides that build up speed and eat up cushion with each step. Once he gets on top of a cornerback, they are at a physical disadvantage down the field where touchdowns are made. On the flip side, Green-Beckham has had issues with drugs in the past and was kicked out of school for a domestic violence incident. 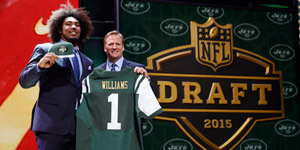 Questions of maturity are real and could torpedo his draft stock more than some think, but what should also concern teams is that the year of football he missed last season puts him behind in his education in the game at that position. He will be great or a zero in the league in my opinion. Forget his sluggish combine times, Shelton has the mass and lateral quickness of Vince Wilfork with some Casey Hampton thrown in. He manhandles blockers in front of him. What's the problem? Will Shelton keep himself in game shape after he gets paid? His weight can be a big issue if he's not careful. There are coaches from the former Washington staff who believe Shelton had a "contract year" and that he was on his best behavior as he began on his path to the NFL draft. Some NFL teams question whether or not he'll even be on the field on passing downs when defenses go to sub packages, and they point out that his sack numbers came against inferior competition this season. If Shelton plays limited snaps due to coming off the field more than expected, it would put even more pressure on him to dominate against the run. If he doesn't do so, he might catch the bust label, but his ability to play with strength and quickness at the point of attack is undeniable. When I first watched Clemmings on tape, I got excited ... VERY excited. Clemmings is a former high school basketball player and defensive end turned offensive tackle who has terrific feet and overall athleticism. He has power in his hands and a frame that most offensive tackles would kill for. Then the Senior Bowl practices happened. Clemmings was beaten time and time again in pass protection, and his technique flaws and waning confidence during the week grabbed everyone's attention. On the high side, Clemmings could be a Pro Bowl tackle and the next Duane Brown. Like Brown out of Virginia Tech, Clemmings is still a work in progress after playing just two years of playing offensive tackle. His physical tools might be the best in this draft. On the bust side, Clemmings could be like former first-round bust Jason Smith, who disappointed badly during his time with the St. Louis Rams. Dawson has admitted in the past to running late for a meeting here or there, and that he hasn't always gotten along with his position coach at TCU. To make matters worse, Dawson's scouting combine was uninspired and showed a complete lack of NFL athleticism in the tests that usually matter most to NFL defensive coordinators and linebacker coaches. However, this guy can ball. Dawson's instincts and production are off the charts, and are untouchable by any linebacker in this draft. Dawson was targeted 29 times in the passing game, and he came away with four interceptions and nine passes defensed. Dawson allowed no broken tackles, and added six sacks and three fumbles recovered. Dawson's production and instincts are first-round worthy, but he must prove he's fast enough for the NFL game or he'll be just another guy as a pro. Collins has long arms, height and make-up speed to keep him in just about every play, and he shows the ability to play tight man-to-man coverage and is a willing tackler against the run. The bust side? He has 10 career starts and never really locked in as a full-time starter at LSU. Even if Les Miles wanted to work in other talent, would you really take a "special" cornerback off the field if you didn't have to? Which former LSU cornerback will Collins more closely resemble, Patrick Peterson or Morris Claiborne? Peters has tremendous cover ability and potential, but the tape shows a player that is inconsistent with on-field discipline and willingness to play inside the structure of the defense. Peters has great size and aggressiveness, but he didn't always play like a first-rounder in 2014, and then there's that whole "kicked off the team" thing that cannot be overlooked. He has the talent, but Peters has to harness his emotions and prove that he is coachable or he'll get torched on the pro level. Coleman's blazing open-field speed allowed him to punish Big Ten defenders, finishing with 2,036 yards rushing at 7.5 yards per carry. In the NFL, running backs are either creators or tackle breakers, and according to STATS data Coleman was neither. Coleman broke a tackle or made someone miss on just 12.2 percent of his carries. Melvin Gordon, Jay Ajayi and Todd Gurley all finished at just over 21 percent, while Duke Johnson clocked in at 19 percent. If Coleman gets in the right scheme, he has a chance to become an electric ball carrier with home-run potential on any given carry. However, if he doesn't show more wiggle or physicality through contact, scheme won't matter.